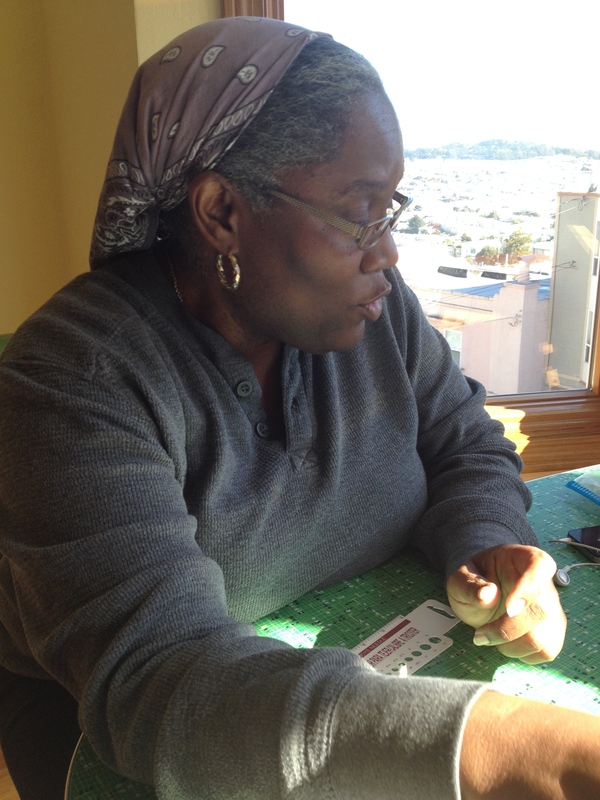 “You have to decide what kind of knitter you want to be,” counsels Angela F. Thomas, while sitting in my sunny front room telling stories and explaining the difference between a knit and a pearl. I’m just concentrating on knitting today. Anything else is a mistake. Ideally, the rows will be identical, and I will learn to smoothly guide the yarn over the top of needle without looking—some day, maybe. Today is not that day. Oh, I get it, in theory. 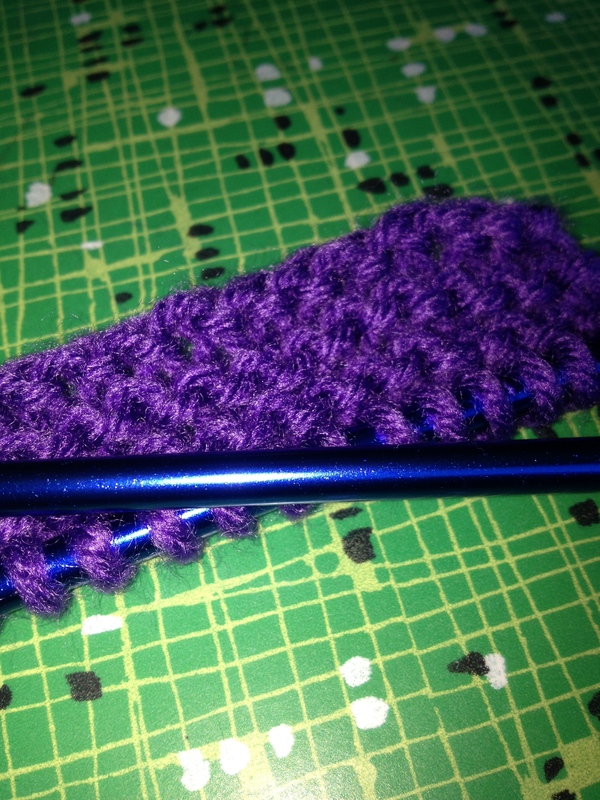 Now if I could only remember how to cast… It doesn’t matter; I’ve had my first lesson, and I’m hooked on knitting. 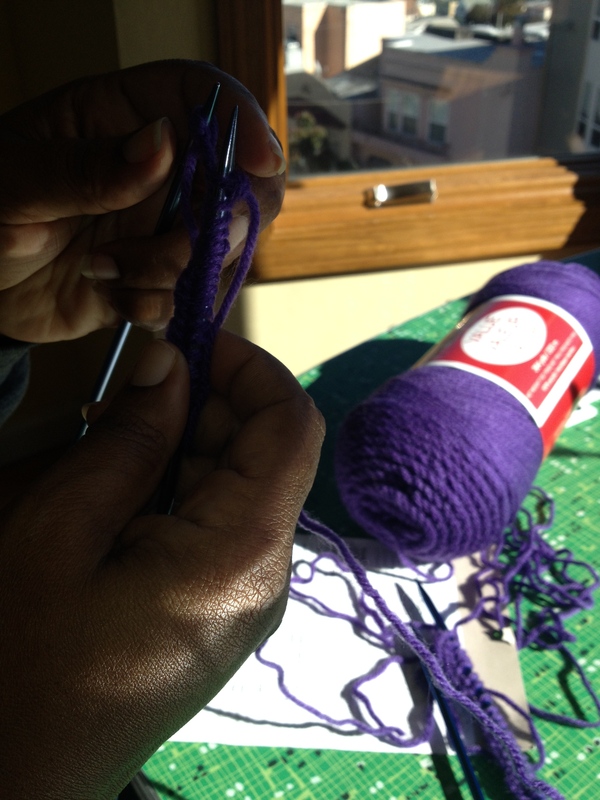 I’m convinced that with the right teacher, anyone can learn to knit and the benefits can make it worth your time. Knitting is not only fun, it builds manual dexterity, is a way to make TV time productive and buys a person entry into one of the oldest crafts in civilized society. I’m in. After spending time with a great teacher, I can see that another wonderful benefit of learning to knit is the community building it affords. Storytelling is essential to knitting. Angela sits with her glass of green juice, instead of the Coke she requested, explaining how her mother and grandmother taught her. I tell her about green juice and my vegetable garden while I laugh at my mistakes. She steps behind me, wraps her arms around me and guides my hands with the needles in them. “We mustn’t lose this art,” Angela explains. We have to hold on to sitting together for these face-time moments. Life is not only emails and text messages. We have to have soup and tea while we share our gifts and tell our stories. Only when we tell our story while a friend listens do we become whole. The things we reciprocate, heal us, soothing out the weariness of city life, strengthening a connection born in another context. I feel as if I’ve met Angela’s elderly mother after sitting in a room knitting with her daughter for two hours. That’s the gift of presence that comes from making time for one another. Our friend’s son gave her a pillow for Christmas that said, “If I’m sitting, I’m knitting.” I like how portable knitting can be. Wish you could join us for knitting night at the farm. Some of us participated in a community “tree sweater” last year, each making a part and then meeting to sew it onto the tree. Maybe we’ll do our arbor some day . . . . Enjoy your scarf!